Guineas can be a bit more difficult to find than chickens, although their popularity is quickly increasing. The easiest way to raise guineas is to start them as babies, called keets. Otherwise you will have problems keeping your guineas at home and they will simply fly off to wheresoever they prefer. Keets are rather fragile creatures - more so than chickens, so keet care instructions should be strictly followed. You can find them in feed stores in the spring and summer. Another good option is to check your local paper and local online postings. Buying them online and having them shipped is possible, although not recommended because the keets are deceivingly fragile and may encounter complications from the shipping. 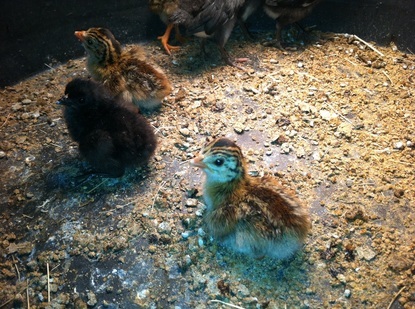 Raising guineas from fertile guinea fowl eggs or by brooding baby guineas (keets) is a popular method for starting your first guinea fowl flock. Raising baby guineas by hand can help ensure your backyard guineas are tame and friendly. 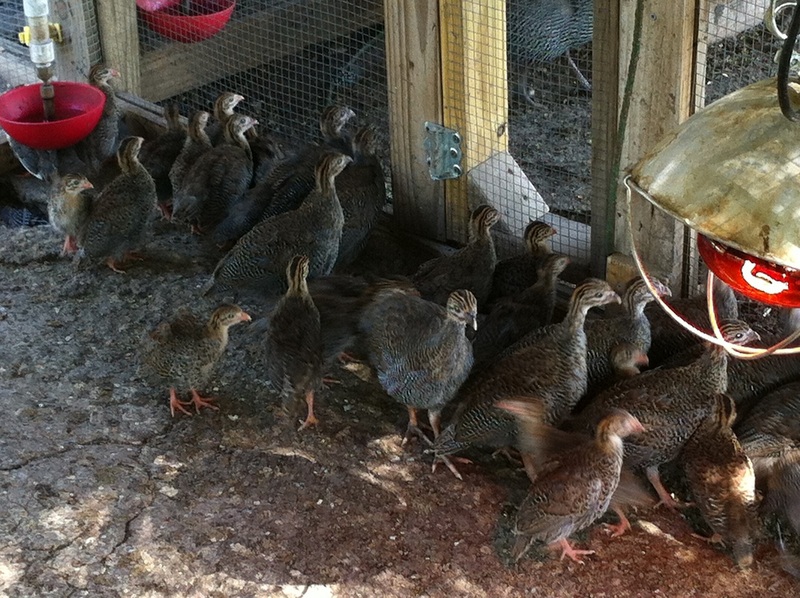 Guinea hens lay approximately two clutches of eggs per year. The hens begin to lay in April or May, but do not become broody early in the season. If you want to hatch clutches earlier, place the eggs under a broody chicken hen or hens, depending upon the number of eggs. ​The clutches are typically 20 to 30 eggs. After the hen has laid about a dozen eggs, she will become broody and stay on her nest. If your are birds are free-ranging, it may be very difficult for you to locate the nest. Guineas prefer to make nests on the ground in tall grasses, but we have successfully convinced guineas to use nesting boxes (see photo at right). 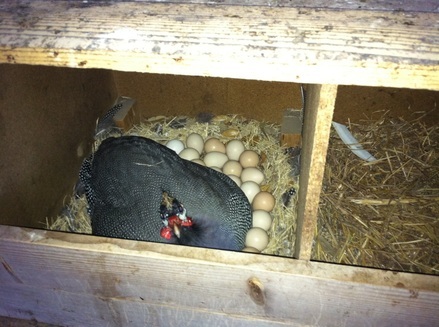 Be aware that guinea hens are very protective of their nests and will attach anything that comes in close proximity. One of our 100+ pound livestock guardian dogs is terrified of a broody 7 pound guinea hen - and so are we! The incubation period for guinea eggs is 26 to 28 days. The eggs may be incubated under a guinea hen, bantam setting hens (10-15 eggs) or chicken setting hens (25-30 eggs), or any reliable man-made incubator for which you should carefully follow the instructions. If no instructions are listed for Guineas, follow the instructions for Pheasants or Turkeys. For more additional information on incubators click here. If you are hatching your own birds or have purchased keets of various sizes, do not keep the birds in the same brooder. Keets grow rapidly and only one week of age difference can result in newly hatched keets being run over by larger keets. Use different boxes or troughs to separate age groups. As a general guideline, a large box or feed trough (12 feet square) makes a good brooder box for 25 to 30 newly hatched keets. Any smaller and the birds will crush each other under stress and maim or kill their roommates accidentally. Guineas are prone to leg injuries, so do not use newspaper in the bottom of the of the shelter. Slick footing sets the birds up for the opportunity to get a splayed leg, also known as "sprraddle leg" which if not corrected, will eventually be enough of a detriment that it will kill them. Death results from either the natural pecking order of the other birds, inability to roost and get off the ground, or simply its inabilty to sufficiently get around as it gets older - particularly as a free-ranging bird. Use a large container such a rubber trough with a textured bottom. A large container allows the keets to move towards or away from the heat lamp as needed to regulate their body temperature. Line the bottom of the trough with cloth towels. Old towels are likely best and they may need to be discarded once it is time to move your keets to the coop. Leave ridges and lumps in the towels to provide an uneven surface. Cover the cloth towels in long strips of paper towels that are crumbled and then somewhat straightened out. Do not tear the paper towels into individual sheets or they won't stay in place and small birds may potentially get caught underneath them. Untreated pine shavings can work well, in a pinch, but they should be replaced as soon as possible as the shavings can also be slick for the small birds. Paper should only be used in conjunction with a towel. The surface of the keets home is critical until about 3 months of age, so even when rehoming to a coop, be sure to inspect it daily for over slick spots that may be created or areas where the keets could injure their legs. Be particularly conscious of muddy spots that may occur around watering areas. ​A guinea with an injured leg will have an extremely challenging time surviving - whether to be picked off by predators, or more likely bullied to death by other guineas. Place the feed and water close to the heat source for the first day and observe the birds behavior carefully to determine their comfort level. If they are moving to cooler parts of the brooder, raise the light and modify food and water placement accordingly to ensure they are eating and drinking. Start on a good Pheasant or Turkey starter feed (28% to 30% protein). The high protein makes them grow fast. ​For very young keets, scatter about 1 ounce of food per bird on the floor of the brooder. ​Once the birds are able to reach into a feeder, switch to placing the feed in a chick feeder. ​Closely monitor food consumption and increase as needed. Keets grow rapidly. First water given keets upon arrival at your home should be warm to prevent chilling. Make sure they can't get in the water or they will get wet and chill or drown. Use marbles or rocks to fill the water area so as to make a shallow drinking area. You may also add 1 tablespoon of sugar per quart of water to give them quick energy. You may also add electrolytes or Terramycin to help relieve traveling stress. Look at the size of the helmet and wattles. The helmet is the protuberance on the top of the head of a guinea fowl. The wattles are fleshy appendages that hang from the sides of the head. The helmets and wattles of the male are much larger than those of the female. Once your keets begin to get flight feathers, you can consider moving them to the coop. Birds of about 2-3 weeks of age are generally getting flight feathers. If the weather is cool, don't forget you will also need a heat lamp in the coop. If you already have adult birds, it is worthwhile to have a coop dedicated to the keets. The same problem with adult keets exists as with that of keets of different ages - the adult keets can panic and trample the youngsters. ​Keets can be mixed with adult guineas at about 3 months of age - about the time their faces begin to lose their feathers and their legs are developed enough to pace with the adult guineas. It is fine for birds of about 3 weeks to 4 months to share the same coop as long as there is plenty of square footage for each bird. Cinder blocks can make handy resting places for the smaller birds when they want some peace from the more active, older birds. Hawks, owls and other birds of prey are the biggest problems for guineas. When you are missing a bird, that's most likely the culprit. Birds of prey learn where to find an easy meal. Sadly, it's also been seen where hawks will simply take the heads off the birds so sport. When this happens, be immediately prepared to keep your birds housed for a week or two - or until you are confident the danger has passed. Even turning them out while you are supervising them is not 100% effective. For more information on predators, please visit the Poultry Predators page.